My favorite thing to do is eat. 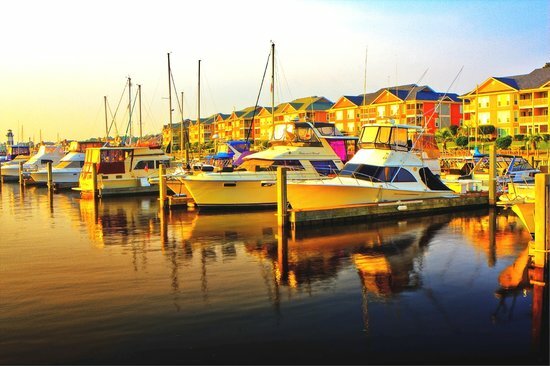 That and visit the small towns that line the coast and waterways of the Myrtle Beach area. 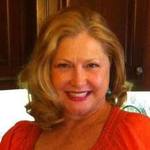 I grew up on South Carolina’s Grand Strand and food is a big part of the coastal living experience. Starting at Peaches Corner on the boulevard to Brants hamburgers by the “big rollercoaster.” Some old favorites are still there, some are long gone. 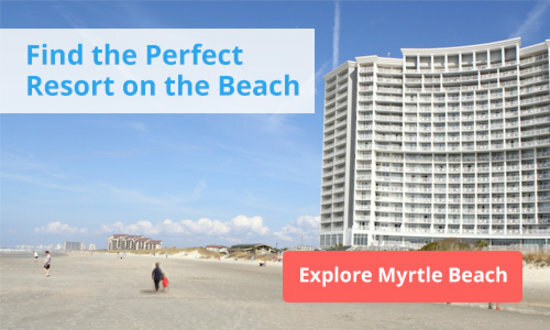 But the rich history of the Myrtle Beach area lives in the quaint towns that surround it. 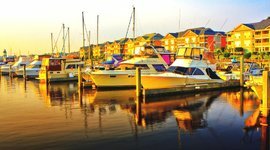 So, if you’re craving a break from the beach, and want to really get a feel for the entire area, take a relaxing day trip with the family through the laid-back, river and beach towns. In hindsight, it may turn out to be your favorite day of the trip. Many of you pass through Conway heading into Myrtle Beach. 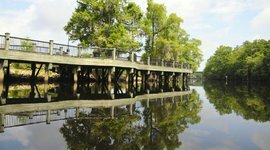 This town is home to a gorgeous trail along the Waccamaw River that seems like something out of a movie. The historic Riverwalk is a coveted wedding photo op that weaves through historic buildings, oak trees, and the glass-like reflection on the water. 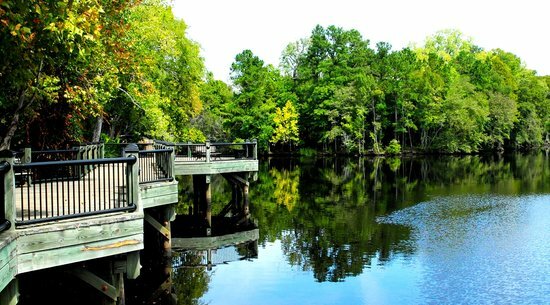 It's one of the area's many great nature adventures. 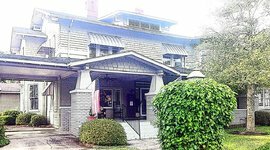 Conway is known for preserving its historic buildings. They even pave around old trees, leaving them in middle of the road. The town leaders’ tenacity for all things historic is a welcome change in this day of throwaway landmarks and paved paradise. And while you’re here be sure to stop by some of Conway’s best restaurants, including Crady’s, Rivertown Bistro, Dilly Beans, Black Thai, The Outer Limits, Oliver’s, and El Cerro. Carolina Beach is reminiscent of the Myrtle Beach area from years past. 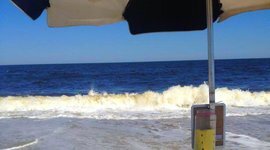 Visit Island Ice on the Carolina Beach Boardwalk for homemade gelato and Italian ice, as you stroll down the newly refurbished boardwalk. Try the Lemon Cookie Gelato! 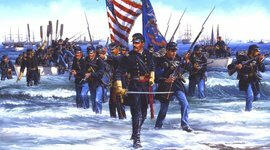 Then, jump on the ferry to Ft. Fisher at Kure Beach for a glimpse into Civil War history. 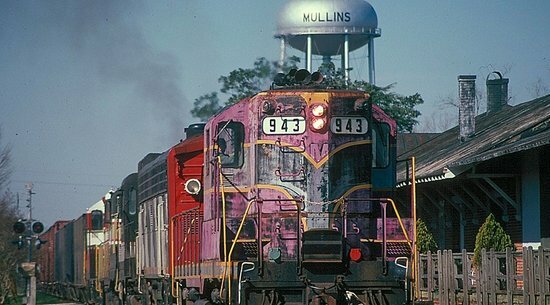 Mullins is a town in the Myrtle Beach area that features a rich tobacco history. There are still tobacco warehouses and a tobacco museum, but the real star of the show here is Webster’s Manor. It’s a Bed and Breakfast housed in an old mansion from the late 1800’s. Here they serve an old-school, southern buffet. Not the kind with plastic plates and forks, but a country buffet with Blue Willow China! They’ve got some of the best fried chicken, turkey and dressing, fried shrimp, and fresh veggies, and they’re also known for their Buttermilk Pie and Coconut Cake! About an hour from Myrtle Beach is Marion, a town as pretty as any historic town you’ve seen! And Marion has some of the best antiquing around. The Marion Emporium, along with the Golden Leaf Antique in neighboring Mullins, offers a treasure trove of antiques that you can’t find elsewhere. 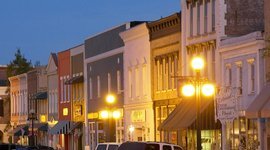 Most people think of Aynor as a drive-by town (similar to a fly-over state) on their way into the Myrtle Beach area. But, there’s one thing you must do here…eat lunch on your way in. 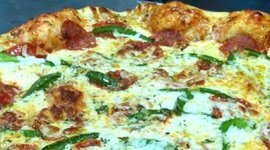 Try the Aynor Inn, just a hop off Hwy. 501, for a country buffet that even serves pancakes on the line, and has the best homemade pizza around! 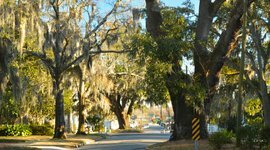 As you may know, some historians claim American history began in Georgetown, SC – even before Charles Town (Charleston). Unfortunately, most of the earliest settlements here failed. Needless to say Georgetown is rich in history and culture with more than 50 historic homes, museums, waterfront restaurants, art galleries, boutiques, bookstores, and plantations that are open to visitors. And it’s only 40 minutes or so from the downtown Myrtle Beach area! Stop by the famous Kudzu Bakery for the best oatmeal raisin cookies in the world. 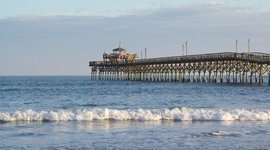 Old fashioned beach houses, seafood shacks, classic tourist souvenirs, and shopping, plus great inlet fishing, Cherry Grove is a snapshot of old-school Myrtle Beach area. 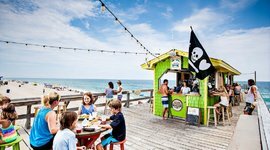 Eat at Duffy’s Seafood Shack for a true beachy meal of shrimp poppers, blackened fish and Po’ Boys. Also, Boulineau's is a must-see destination store, if you do nothing else. 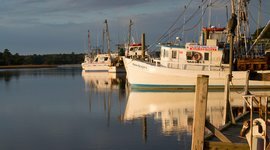 Little River has always been considered a fisherman’s hotspot. And talk about seafood shacks! 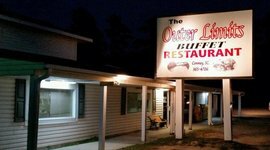 Waterfront seafood is Little River’s claim to fame, with dozens of great restaurants to choose from. 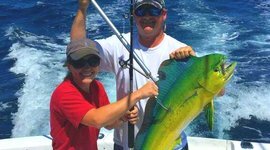 And if you’re looking for a memorable family fishing trip, Little River has the best deep sea fishing charters in the area. If you’re passing Cherry Grove going north, definitely stop by this town. Quaint shops and restaurants pepper the coastline in the seaside town of Calabash. This is the seafood capital of South Carolina. 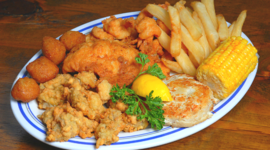 Enjoy a Calabash-style seafood dinner (light and crispy breading on fresh seafood) and then on to Callahan’s of Calabash, a must see gift shop and souvenir store. Callahan’s is really a Christmas store, a very famous one…google it. They also have nautical home accessories, country-style decor, shell souvenirs, candy, and more. While you’re here, you should also check out Indigo Farms, a farmer’s market, roadside stand, bakery, gift, and garden shop all rolled into one...with farm animals to delight the kids! This family owned farm is a great place to grab some organic produce on vacation. 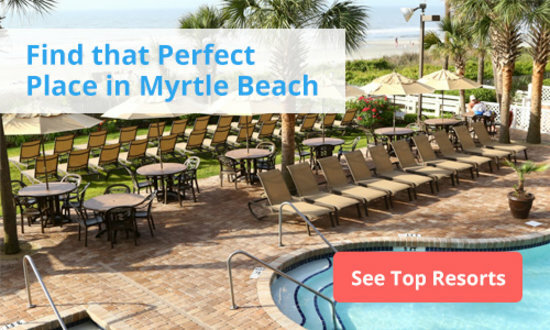 With many small towns surrounding the Myrtle Beach area, a 40 minute to one hour drive can take you away from tourist traffic and toward experiences you won’t find at the beach. It's what Myrtle Beach used be like before all the high-rise hotels. This laid-back beach town is a nice place to unwind. Take a stroll on its newly refurbished boardwalk. This old-fashioned ice cream parlor, on the Carolina Beach Boardwalk, makes their own gelato and Italian ice. Try the Lemon Cookie Gelato! You'll still find tobacco warehouses here, but the crown jewel is Webster's Manor. Stop by for an authentic country buffet in an old mansion from the 1800's. 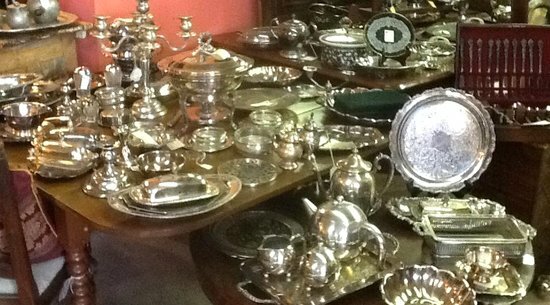 Sit back in an old mansion for an authentic country buffet on Blue Willow China. Their fried chicken and Buttermilk Pie is some of the best around. Housed in a large warehouse, you'll find tons of antiques, some of them hundreds of years old, set up in themed displays. It's like exploring Ikea. 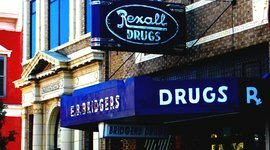 Some think of it as a 'drive by town' on your way in and out of Myrtle. 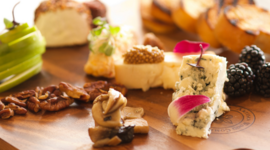 But stop by the Aynor Inn for something surprisingly delicious. 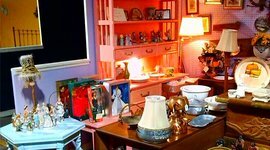 It's filled with tons of items from fine China, silverware, and nick knacks to furniture and leather bound books. 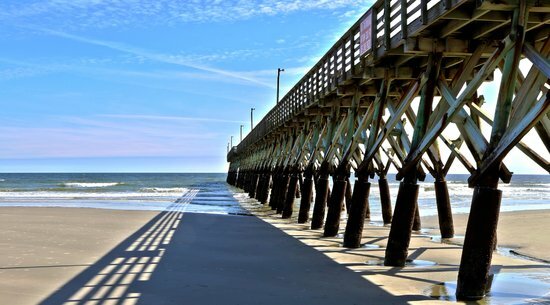 Get a snapshot of old-school Myrtle with beach houses, seafood shacks, and souvenirs. 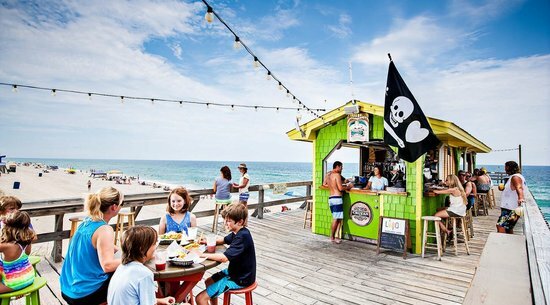 Make sure you eat at Duffy's Seafood Shack for a true beachy meal. 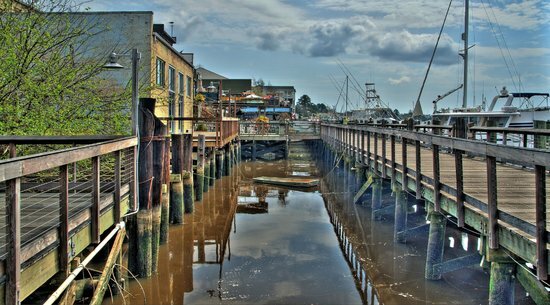 Long considered a fisherman's hotspot, this quaint town has dozens of great seafood restaurants on the waterfront. It's also a great place for deep sea fishing. The light and crispy fried fish that you see all over the Grand Strand comes from Calabash. Also, be sure to check out Callahan's, a famous, quirky Christmas store. Mixing international influences (even sushi) into southern classics, this delicious Conway restaurant has a spacious deck overlooking downtown. 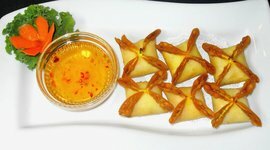 Serving Pad Thai and a variety of curries this is great lunch spot in Conway if you're craving something a little different. This country buffet in Conway serves crispy fried chicken, fantastic collard greens, and great desserts too.